Rabbis and Other Notable Jews. A city of Galicia, Austria, formerly the capital of the kingdom of Poland; founded about 700 C.E. There are no records of the early history of the Jewish community of Cracow, but it is probable that the Jews gained a foothold in the city after the German inhabitants had forfeited their privileges by a revolt against King Ladislaus Lokietek (the Short) in 1311, and that their position became more secure when that monarch removed his capital from Gnesen to Cracow (1312). The ruins of the palace of Lobzow, where Casimir the Great was said to have spent his leisure time with his beautiful Jewish mistress Esterka, are near Cracow, and a large mound of earth in the garden was reverenced as her grave as late as the first half of the nineteenth century. The only record of that period is the massacre in 1348, at the time of the Black Death riots. Records show that the Jews owned houses and lived in Cracow at the end of the fourteenth century, and that King Jagiello (or Jagellon) in 1400 bought from the Jew Jossman one of the stone houses which formed the new university (Sternberg, "Gesch. der Juden in Polen," p. 87). Riots against Jews occurred during the Easter week of 1407, when the mobs were incited by the priest Budek. The Jewish quarter was fired; and in the conflagration a church and several streets inhabited by Christians were destroyed. The visit of Capistrano (Aug., 1453, to May, 1454) had there the same disastrous results for the Jews as it had in other places which he visited (see Responsa of R. M. Minz, No. 63, Cracow, 1617). In 1464 the Jews of Cracow were plundered, and thirty of them killed, by Crusaders. The attacks and riots became so frequent that King John Albert, in 1494, ordered the Jews of Cracow to settle in the present suburb of Kazimierz, which was then a separate city, and it has remained the Jewish quarter ever since. The Judengasse of Cracow proper is the only witness to the fact that Jews lived there before they were confined to Kazimierz. The change gave them no greater security, for their new quarters were attacked with the usual results as soon as the king left the capital. The students of the Cracow University were generally prominent in attacks on the Jews, and their persecutions led to the establishment of relations between the Jews and the authorities of the university, in the records of which the Jews of Cracow are first met with as a corporate body. A Jewish banker was appointed to lend money to students on pledges, and being appointed by the rector, he had the title of privileged servant of the university. In this way the banker became the protector of his fellows against the insults and cruelties of the students. A tax, at first irregularly collected, was also imposed upon the Jews of Cracow for the purchase of books and writing material for the students. This tax, known as "kozubalec," developed into a form of blackmail, levied under the guise of protecting them from attacks by the students. Little is known of the communal and intellectual life of the Jews of Cracow until the sixteenth century, when both appear well developed under the rule of Sigismund 1. (1506-48), who first reduced to order the administration of Jewish affairs in his dominions. It is believed that R. Jacob Pollak, who later became rabbi of Prague, stood, in his younger days, at the head of the Jewish community of Cracow (Dembitzer, "Kelilat Yofi," Preface); but the first rabbi of Cracow known as such is R. Asher, the grandfather of R. Meïr (MaHRaM) Lublin. In his time (he was there as early as 1507, and died about 1532) there were in Cracow a number of Bohemian Jews, under a rabbi named R. Perez. As the result of a dispute between them and the Polish community under R. Asher, King Sigismund decided in 1519 that the latter owned the synagogue and could prevent the Bohemians from entering it. Those times, although not entirely free from violence and persecution, were probably the best which the Jews of Cracow ever enjoyed under Polish rule. Though legally confined to Kazimierz, Jews had places of business in all the principal thoroughfares of Cracow, and even on the Ringplatz. Large penalties were imposed on the city for every riot or act of violence against the Jews. This law, however, passed by the Diet at the instance of Chancellor Christoph Szydlowiecki, fell into disuse, and was suspended by Sigismund in 1536. 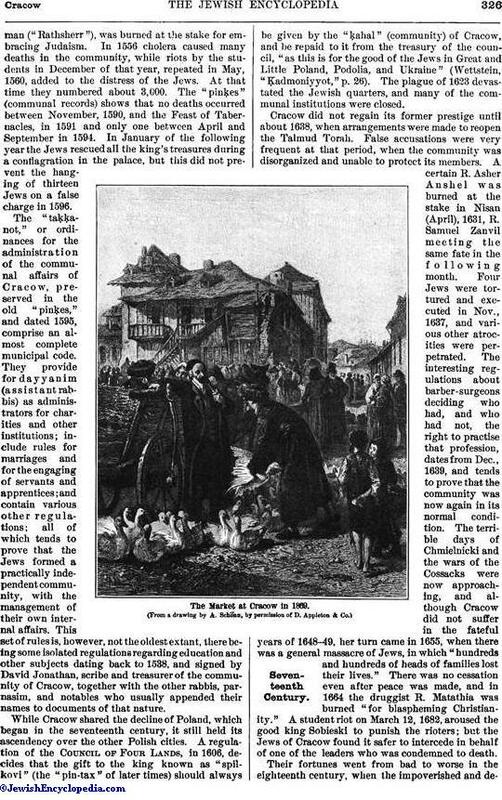 He nevertheless refused to grant the demand of the German merchants, in 1542, that the number of Jews in Cracow be limited, or to listen to their complaint that the Jews sent money out of the country by importing goods from Wallachia (Grätz, "Gesch." ix. 432); showing therein his willingness to protect the Jews of his capital against unjust discrimination. The way-wode Peter Kmit, who rose in influence under Bona Sforza, Sigismund's second wife, did at one time spread the report that the Diet intended to grant to the Jews of Cracow complete liberty of commerce, but this was done for the purpose of extorting money from the Christian merchants. In 1539 Katharina Zelazewska, the widow of an alderman("Rathsherr"), was burned at the stake for embracing Judaism. In 1556 cholera caused many deaths in the community, while riots by the students in December of that year, repeated in May, 1560, added to the distress of the Jews. At that time they numbered about 3,000. The "pinḳes" (communal records) shows that no deaths occurred between November, 1590, and the Feast of Tabernacles, in 1591 and only one between April and September in 1594. In January of the following year the Jews rescued all the king's treasures during a conflagration in the palace, but this did not prevent the hanging of thirteen Jews on a false charge in 1596. The "taḳḳanot," or ordinances for the administration of the communal affairs of Cracow, preserved in the old "pinḳes," and dated 1595, comprise an almost complete municipal code. They provide for dayyanim (assistantrabbis) as administrators for charities and other institutions; include rules for marriages and for the engaging of servants and apprentices; and contain various other regulations; all of which tends to prove that the Jews formed a practically independent community, with the management of their own internal affairs. This set of rules is, however, not the oldest extant, there being some isolated regulations regarding education and other subjects dating back to 1538, and signed by David Jonathan, scribe and treasurer of the community of Cracow, together with the other rabbis, parnasim, and notables who usually appended their names to documents of that nature. While Cracow shared the decline of Poland, which began in the seventeenth century, it still held its ascendency over the other Polish cities. A regulation of the Council of Four Lands, in 1606, decides that the gift to the king known as "spilkovi" (the "pin-tax" of later times) should always be given by the "ḳahal" (community) of Cracow, and be repaid to it from the treasury of the council, "as this is for the good of the Jews in Great and Little Poland, Podolia, and Ukraine" (Wettstein, "Ḳadmoniyyot," p. 26). The plague of 1623 devastated the Jewish quarters, and many of the communal institutions were closed. Cracow did not regain its former prestige until about 1638, when arrangements were made to reopen the Talmud Torah. False accusations were very frequent at that period, when the community was disorganized and unable to protect its members. A certain R. Asher Anshel was burned at the stake in Nisan (April), 1631, R. Samuel Zanvil meeting the same fate in the following month. Four Jews were tortured and executed in Nov., 1637, and various other atrocities were perpetrated. The interesting regulations about barber-surgeons deciding who had, and who had not, the right to practise that profession, dates from Dec., 1639, and tends to prove that the community was now again in its normal condition. The terrible days of Chmielnicki and the wars of the Cossacks were now approaching, and although Cracow did not suffer in the fateful years of 1648-49, her turn came in 1655, when there was a general massacre of Jews, in which "hundreds and hundreds of heads of families lost their lives." There was no cessation even after peace was made, and in 1664 the druggist R. Matathia was burned "for blaspheming Christianity." A student riot on March 12, 1682, aroused the good king Sobieski to punish the rioters; but the Jews of Cracow found it safer to intercede in behalf of one of the leaders who was condemned to death. 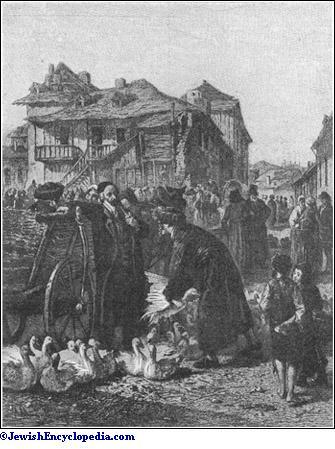 The Market at Cracow in 1869. (From a drawing by A. Schönn, by permission of D. Appleton & Co.)Eighteenth Century. Their fortunes went from bad to worse in the eighteenth century, when the impoverished and degradedcommunity became heavily involved in debt. In Jan., 1726, the leaders and representatives issued a "keruz" (proclamation), calling upon the Jews of Cracow to contribute a twentieth part of their possessions to settle with the commission which the waywode had appointed to liquidate the debts of the community. The proclamation stated that the commission was a great boon, and that the sacrifice which the Jews of Cracow were required to make was the only means of preventing the abolition of the community and averting terrible persecutions and possible exile. The last act of the community of Cracow, before the final partition of Poland, was the "ḥerem," or great ban, pronounced there against the new sect of Ḥasidim on the 25th of Tishri (Sept. 29), 1785. 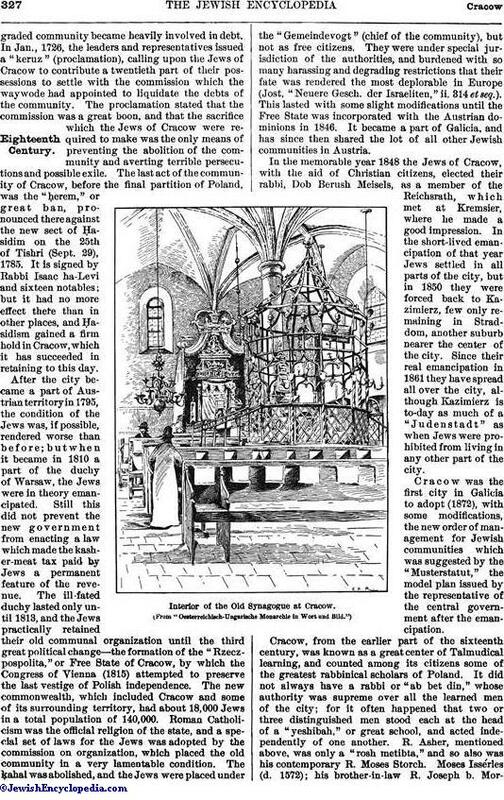 It is signed by Rabbi Isaac ha-Levi and sixteen notables; but it had no more effect there than in other places, and Ḥasidism gained a firm hold in Cracow, which it has succeeded in retaining to this day. After the city became a part of Austrian territory in 1795, the condition of the Jews was, if possible, rendered worse than before; but when it became in 1810 a part of the duchy of Warsaw, the Jews were in theory emancipated. Still this did not prevent the new government from enacting a law which made the kasher-meat tax paid by Jews a permanent feature of the revenue. The ill-fated duchy lasted only until 1813, and the Jews practically retained their old communal organization until the third great political change—the formation of the "Rzeczpospolita," or Free State of Cracow, by which the Congress of Vienna (1815) attempted to preserve the last vestige of Polish independence. The new commonwealth, which included Cracow and some of its surrounding territory, had about 18,000 Jews in a total population of 140,000. Roman Catholicism was the official religion of the state, and a special set of laws for the Jews was adopted by the commission on organization, which placed the old community in a very lamentable condition. The ḳahal was a bolished, and the Jews were placed under the "Gemeindevogt" (chief of the community), but not as free citizens. They were under special jurisdiction of the authorities, and burdened with so many harassing and degrading restrictions that their fate was rendered the most deplorable in Europe (Jost, "Neuere Gesch. der Israeliten," ii. 314 et seq.). This lasted with some slight modifications until the Free State was incorporated with the Austrian dominions in 1846. It became a part of Galicia, and has since then shared the lot of all other Jewish communities in Austria. 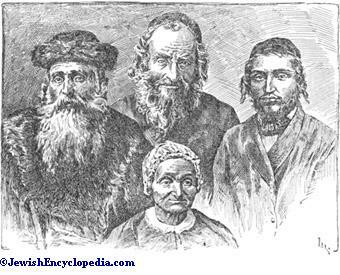 In the memorable year 1848 the Jews of Cracow, with the aid of Christian citizens, elected their rabbi, Dob Berush Meisels, as a member of the Reichsrath, which met at Kremsier, where he made a good impression. In the short-lived emancipation of that year Jews settled in all parts of the city, but in 1850 they were forced back to Kazimierz, few only remaining in Straddom, another suburb nearer the center of the city. Since their real emancipation in 1861 they have spread all over the city, although Kazimierz is to-day as much of a "Judenstadt" as when Jews were prohibited from living in any other part of the city. Cracow was the first city in Galicia to adopt (1872), with some modifications, the new order of management for Jewish communities which was suggested by the "Musterstatut," the model plan issued by the representative of the central government after the emancipation. Interior of the Old Synagogue at Cracow. (From "Oesterreichisch-Ungarische Monarchie in Wort und Bild. ")Rabbis and Other Notable Jews. Cracow, from the earlier part of the sixteenth century, was known as a great center of Talmudical learning, and counted among its citizens some of the greatest rabbinical scholars of Poland. It did not always have a rabbi or "ab bet din," whose authority was supreme over all the learned men of the city; for it often happened that two or three distinguished men stood each at the head of a "yeshibah," or great school, and acted independently of one another. R. Asher, mentioned above, was only a "rosh metibta," and so also was his contemporary R. Moses Storch. Moses Issérles (d. 1572); his brother-in-law R. Joseph b. MordecaiGerson Kohen (d. 1591); Eliezer Ashkenazi (d. 1586): Isaac b. David Shapira (d. 1582); Mordecai Singer (d. 1576); Joel, the stepfather of the above-mentioned Joseph Kohen; Eliezer Treves; Meïr b. Gedaliah; Moses Mordecai Margoliot; and many other learned men have all been rabbis, or great religious teachers, who decided religious questions separately or in conjunction with others; but none of them was ever elected to the headship of the entire community. Sometimes one scholar, or even one who was not a recognized rabbinical authority, was placed, by the ruler of the land, at the head of the community, with legal jurisdiction, though not with the religious authority of the office. Such cases were rare, and most scholars succeeded one another in the limited authority which the community chose to confer on the heads of yeshibot, who were not especially selected as rabbis of the whole community. The first rabbi who enjoyed the title of "ab bet din" of Cracow and the province was R. Isaiah Menahem b. Isaac (159199). His successor, R. Meshullam Phoebus, or Feivush, of Brest (d. 1617), was in Cracow at least as early as 1605. Nathan b. Solomon Shapiro became the head of a yeshibah in 1617, and held this position until his death in 1633. He was not, however, rabbi of the community, that position being held by R. Joel ben Samuel Sirkes. Nathan was succeeded as "rosh metibta" by R. Joshua Höschel b. Joseph of Wilna, who died in 1648; and R. Joel, who died in 1640, was succeeded (1644) by R. Yom-Ṭob Lipman Heller four years later, who also succeeded R. Joshua, dying in 1654. Rabbi Joshua Höschel ben Saul (known as "Reb Heschele") of Lublin became rabbi of Cracow the same year, dying in 1664. He was succeeded by R. Aryeh Löb b. Zachariah, "the prophet" who died in 1671. His successor was R. Aaron Samuel Kaidanower of Wilna, who died in 1676, and was succeeded by R. Isaac Ḥarif Landau of Opatow, who died in 1683. The next rabbi, Aaron Teomim, who was chosen in 1687, did not arrive until 1690, and died four months after his arrival. For about ten years, during which time no regular rabbi was appointed, R. Saul Katzenellenbogen of Pinczow attended to some of the rabbinical duties. In 1693 R. Jehudah Löb, son of R. David b. Samuel (Ṭure Zahab) of Lemberg, was chosen rabbi about 1700; he either died, or left for Brest. R. Saul, the son of the above R. Heschel, succeeded R. Löb, and died in 1707. There was again a vacancy for several years, for the next rabbi, R. Jehuda Löb b. Isaac of Shidlov, came to Cracow after 1714. He died between 1730 and 1732, and was succeeded by his son R. David Samuel Schmelka, who lived until 1741. He was succeeded by R. Isaac Joseph Teomim, who, in 1745, returned to Breslau to succeed his father. After an interregnum of nine years R. Isaac Landau of Zolkiev was chosen, and held the position until his death in 1767. He was succeeded by R. Aryeh Löb b. Samuel of Tarnow, who died 1776, and was followed by R. Isaac ha-Levi of Lemberg, who died in 1799. R. Moses Solomon of Warsaw (Brody? 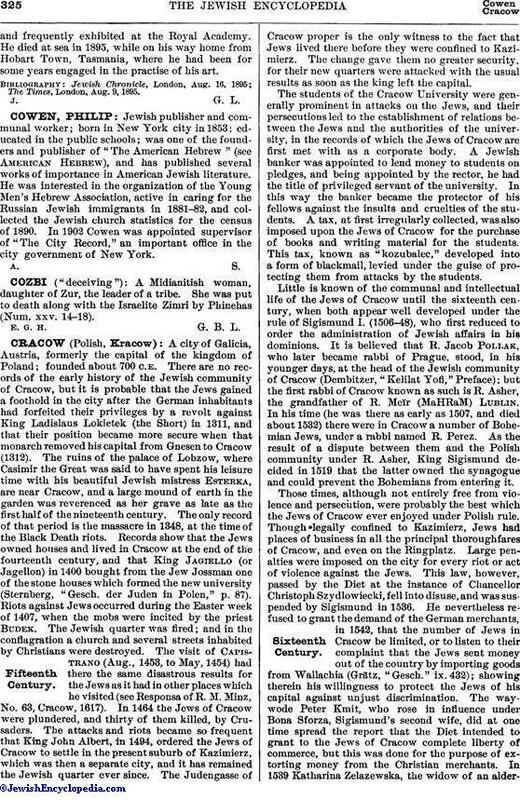 ), formerly rabbi of Koretz, was elected to succeed him; but after preaching one sermon in the old synagogue he went to Warsaw, where he remained until his death in Dec., 1815. He retained, however, the title of rabbi of Cracow, for which he is said to have paid 500 ducats, and was so styled by others in refer ences made to him in contemporary writings. 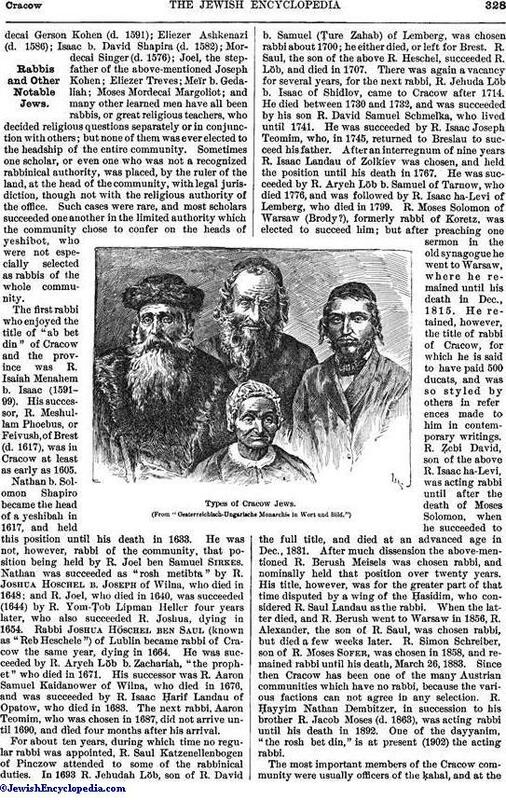 R. Ẓebi David, son of the above R. Isaac ha-Levi, was acting rabbi until after the death of Moses Solomon, when he succeeded to the full title, and died at an advanced age in Dec., 1831. After much dissension the above-mentioned R. Berush Meisels was chosen rabbi, and nominally held that position over twenty years. His title, however, was for the greater part of that time disputed by a wing of the Hasidim, who considered R. Saul Landau as the rabbi. 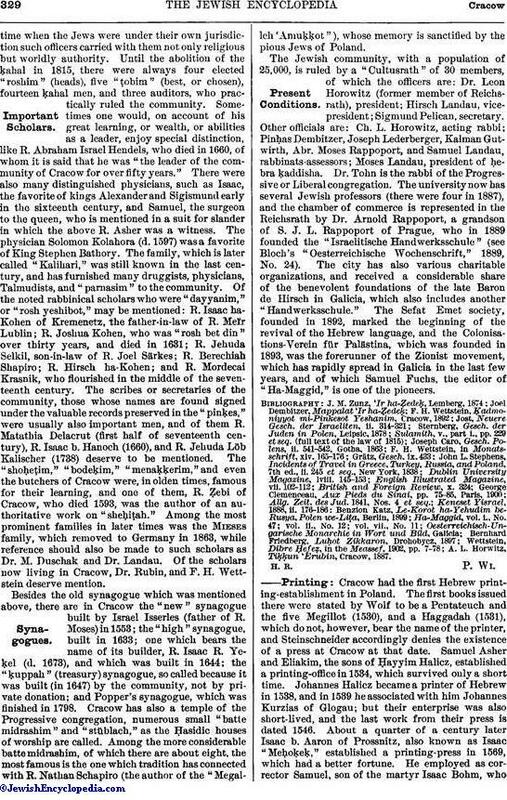 When the latter died, and R. Berush went to Warsaw in 1856, R. Alexander, the son of R. Saul, was chosen rabbi, but died a few weeks later. R. Simon Schreiber, son of R. Moses Sofer, was chosen in 1858, and remained rabbi until his death, March 26, 1883. Since then Cracow has been one of the many Austrian communities which have no rabbi, because the various factions can not agree in any selection. R. Hayyim Nathan Dembitzer, in succession to his brother R. Jacob Moses (d. 1863), was acting rabbi until his death in 1892. One of the dayyanim, "the rosh bet din," is at present (1902) the acting rabbi. (From "Oesterreicbisch-Ungarische Monarchie in Wort and Bild. ")Important Scholars. The most important members of the Cracow community were usually officers of the ḳahal, and at thetime when the Jews were under their own jurisdiction such officers carried with them not only religious but worldly authority. Until the abolition of the ḳahal in 1815, there were always four elected "roshim" (heads), five "ṭobim" (best, or chosen), fourteen ḳahal men, and three auditors, who practically ruled the community. Sometimes one would, on account of his great learning, or wealth, or abilities as a leader, enjoy special distinction, like R. Abraham Israel Hendels, who died in 1660, of whom it is said that he was "the leader of the community of Cracow for over fifty years." There were also many distinguished physicians, such as Isaac, the favorite of kings Alexander and Sigismund early in the sixteenth century, and Samuel, the surgeon to the queen, who is mentioned in a suit for slander in which the above R. Asher was a witness. The physician Solomon Kolahora (d. 1597) was a favorite of King Stephen Bathory. The family, which is later called "Kalihari," was still known in the last century, and has furnished many druggists, physicians, Talmudists, and "parnasim" to the community. Of the noted rabbinical scholars who were "dayyanim," or "rosh yeshibot," may be mentioned: R. Isaac ha-Kohen of Kremenetz, the father-in-law of R. Meïr Lublin; R. Joshua Kohen, who was, "rosh bet din" over thirty years, and died in 1631; R. Jehuda Selkil, son-in-law of R. Joel Särkes; R. Berechiah Shapiro; R. Hirsch ha-Kohen; and R. Mordecai Krasnik, who flourished in the middle of the seventeenth century. The scribes or secretaries of the community, those whose names are found signed under the valuable records preserved in the "pinḳes," were usually also important men, and of them R. Matathia Delacrut (first half of seventeenth century), R. Isaac b. Hanoch (1660), and R. Jehuda Löb Kalischer (1738) deserve to be mentioned. The "shoḥeṭim," "bode2ḳim," "menaḳḳerim," and even the butchers of Cracow were, in olden times, famous for their learning, and one of them, R. Ẓebi of Cracow, who died 1593, was the author of an authoritative work on "sheḥiṭah." Among the most prominent families in later times was the Mieses family, which removed to Germany in 1863, while reference should also be made to such scholars as Dr. M. Duschak and Dr. Landau. Of the scholars now living in Cracow, Dr. Rubin, and F. H. Wettstein deserve mention. Besides the old synagogue which was mentioned above, there are in Cracow the "new" synagogue built by Israel Isserles (father of R. Moses) in 1553; the "high" synagogue, built in 1633; one which bears the name of its builder, R. Isaac R. Yeḳel (d. 1673), and which was built in 1644; the "ḳuppah" (treasury) synagogue, so called because it was built (in 1647) by the community, not by private donation; and Popper's synagogue, which was finished in 1798. 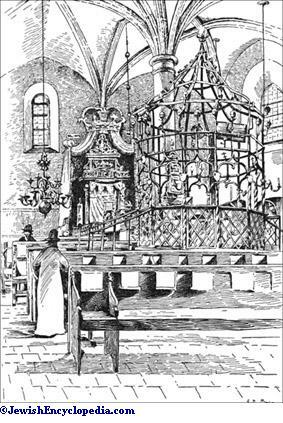 Cracow has also a temple of the Progressive congregation, numerous small "batte midrashim" and "stüblach," as the Ḥasidic houses of worship are called. Among the more considerable batte midrashim, of which there are about eight, the most famous is the one which tradition has connected with R. Nathan Schapiro (the author of the "Megallch 'Amuḳḳot"), whose memory is sanctified by the pious Jews of Poland. The Jewish community, with a population of 25,000, is ruled by a "Cultusrath" of 30 members, of which the officers are: Dr. Leon Horowitz (former member of Reichsrath), president; Hirsch Landau, vice-president; Sigmund Pelican, secretary. Other officials are: Ch. L. Horowitz, acting rabbi; Pinḥas Dembitzer, Joseph Lederberger, Kalman Gutwirth, Abr. Moses Rappoport, and Samuel Landau, rabbinats-assessors; Moses Landau, president of ḥebra ḳaddisha. Dr. Tohn is the rabbi of the Progressive or Liberal congregation. The university now has several Jewish professors (there were four in 1887), and the chamber of commerce is represented in the Reichsrath by Dr. Arnold Rappoport, a grandson of S. J. L. Rappoport of Prague, who in 1889 founded the "Israelitische Handwerksschule" (see Bloch's "Oesterreichische Wochenschrift," 1889, No. 24). The city has also various charitable organizations, and received a considerable share of the benevolent foundations of the late Baron de Hirsch in Galicia, which also includes another "Handwerksschule." The Sefat Emet society, founded in 1892, marked the beginning of the revival of the Hebrew language, and the Colonisations-Verein für Palästina, which was founded in 1893, was the forerunner of the Zionist movement, which has rapidly spread in Galicia in the last few years, and of which Samuel Fuchs, the editor of "Ha-Maggid," is one of the pioneers. A. L. Horwitz, Tiḳḳun 'Erubin, Cracow, 1887. 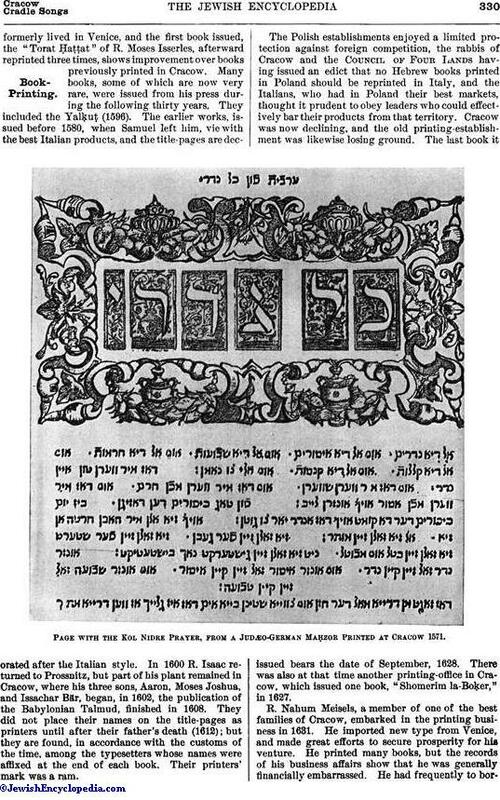 Cracow had the first Hebrew printing-establishment in Poland. The first books issued there were stated by Wolf to be a Pentateuch and the five Megillot (1530), and a Haggadah (1531), which do not, however, bear the name of the printer, and Steinschneider accordingly denies the existence of a press at Cracow at that date. Samuel Asher and Eliakim, the sons of Ḥayyim Halicz, established a printing-office in 1534, which survived only a short time. Johannes Halicz became a printer of Hebrew in 1538, and in 1539 he associated with him Johannes Kurzias of Glogau; but their enterprise was also short-lived, and the last work from their press is dated 1546. About a quarter of a century later Isaac b. Aaron of Prossnitz, also known as Isaac "Meḥoḳeḳ," established a printing-press in 1569, which had a better fortune. He employed as corrector Samuel, son of the martyr Isaac Bohm, whoformerly lived in Venice, and the first book issued, the "Torat Ḥaṭṭat" of R. Moses Isserles, afterward reprinted three times, shows improvement over books previously printed in Cracow. Many books, some of which are now very rare, were issued from his press during the following thirty years. They included the Yalḳuṭ (1596). The earlier works, issued before 1580, when Samuel left him, vie with the best Italian products, and the title-pages are decorated after the Italian style. In 1600 R. Isaac returned to Prossnitz, but part of his plant remained in Cracow, where his three sons, Aaron, Moses Joshua, and Issachar Bär, began, in 1602, the publication of the Babylonian Talmud, finished in 1608. They did not place their names on the title-pages as printers until after their father's death (1612); but they are found, in accordance with the customs of the time, among the typesetters whose names were affixed at the end of each book. Their printers' mark was a ram. The Polish establishments enjoyed a limited protection against foreign competition, the rabbis of Cracow and the Council of Four Lands having issued an edict that no Hebrew books printed in Poland should be reprinted in Italy, and the Italians, who had in Poland their best markets, thought it prudent to obey leaders who could effectively bar their products from that territory. Cracow was now declining, and the old printing-establishment was likewise losing ground. The last book it issued bears the date of September, 1628. There was also at that time another printing-office in Cracow, which issued one book, Shomerim la-Boḳer," in 1627. 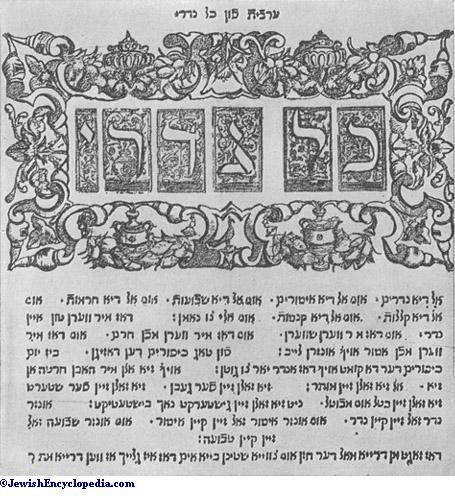 Page with the Kol Nidre Prayer, from a JudÆo-German MaḤzor Printed at Cracow 1571. R. Nahum Meisels, a member of one of the best families of Cracow, embarked in the printing business in 1631. He imported new type from Venice, and made great efforts to secure prosperity for his venture. He printed many books, but the records of his business affairs show that he was generally financially embarrassed. He had frequently to borrowon unfavorable terms, or to take in partners; to pledge his plant and books to creditors; and, at last, to sell his house. The calamitous years of 1648-49 added to his difficulties, and in the latter year he failed, closing with the publication of "Ẓuḳ ha-'Ittim," by R.Meïr of Shebreshin, in which the disasters of the Cossack war are described in the quaint rabbinical style of that period. What remained of the plant of R. Nahum Meisels, who died in 1659, was inherited by his son-in-law, Jehuda Löb Meisels, who began to print books on a small scale in that year and continued until 1670, when he, too, was forced to suspend work. For over 130 years in the period of the decline of Poland, Cracow had no Hebrew printing-office. In 1803 the wealthy Naphtali Hirz ha-Kohen Schapiro opened an establishment, and in 1820 his son Aaron Solomon became his associate. They sympathized with the "Haskalah," or progressive ideas, and did much to encourage its literature, but were forced to close their establishment in 1823 after having sustained great losses. There was again an interval of about forty years, when Karl Budweiser, in 1863, began the printing of Hebrew books. The most notable among the works issued from his office, before he removed to Lemberg in 1874, are those of S. J. L. Rappoport and Mieses. In 1879 Joseph Fischer established a Hebrew printing-office, which is now in a flourishing condition, and which has contributed to make Cracow a center of Neo-Hebrew literature during the last two decades. 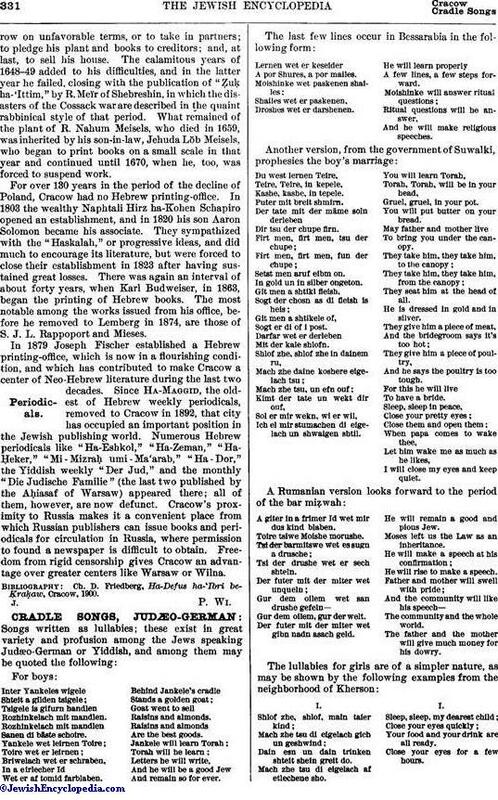 Since Ha-Maggid, the oldest of Hebrew weekly periodicals, removed to Cracow in 1892, that city has occupied an important position in the Jewish publishing world. Numerous Hebrew periodicals like "Ha-Eshkol," "Ha-Zeman," "Ha-Ḥeker," "Mi-Mizraḥ umi-Ma'arab," "Ha-Dor," the Yiddish weekly "Der Jud," and the monthly "Die Judische Familie" (the last two published by the Aḥiasaf of Warsaw) appeared there; all of them, however, are now defunct. Cracow's proximity to Russia makes it a convenient place from which Russian publishers can issue books and periodicals for circulation in Russia, where permission to found a newspaper is difficult to obtain. Freedom from rigid censorship gives Cracow an advantage over greater centers like Warsaw or Wilna. Ch. D. Friedberg, Ha-Defus ha-'Ibri be-Ḳraḳaw, Cracow, 1900.